As Trump distracts with crude sleight-of-hand tricks like a truly bad magician—slurring “Pocahantas” and Navajo heroes under the gaze of genocidal Andrew Jackson, for example—we all wonder what damage his minions are doing behind the scenes. Well, next Monday in Salt Lake City, Trump will boast about one of his worst travesties as he announces his intention to shrink the boundaries of a sacred cultural landscape honored by President Obama in the form of Bears Ears National Monument. Simultaneously, and also under the radar, is the so-called tax bill that will open the Arctic National Wildlife Refuge to oil drilling. Let’s talk about Bears Ears. It’s a place I know well—and love. 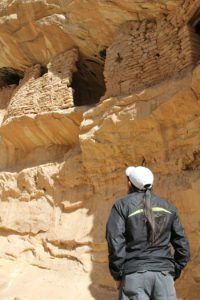 By 2015, Navajos in Utah were taking the lead in a movement to create a protected cultural landscape around Cedar Mesa. 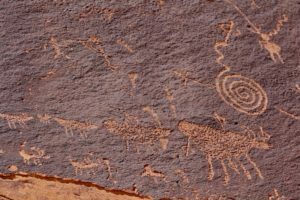 The Navajo and Ute who live closer to Cedar Mesa—and the two protruding rocks above to the north that resemble a bear’s ears—were partnering with Utah environmentalists and had formed Dine Bikeyah. The Hopi and Zuni were suspicious. They still hold grudges about all the attention the larger Navajo Tribe gets, while both Hopi and Zuni consider the Navajo to be newcomers to the Southwest, having migrated in 500 years ago. In the spring of 2015, I was invited to Zuni to show films and I had some heart-to-heart talks with Zuni and then Hopi friends about the growing campaign to protect the Cedar Mesa cultural landscape. I urged them to go up north to an upcoming Dine Bikeyah meeting in Bluff to discuss developing a strategy to protect the Cedar Mesa area with the Navajo and Ute leaders, to whom the landscape is also sacred. 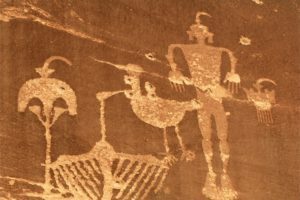 This historic language represents the protection of a sacred landscape containing 100,000 archaeological sites—including burials vulnerable to pot-hunters and petroglyph panels that locals use for target practice (see photo at bottom). It set off a bomb in the ranks of the Sagebrush Rebellion and re-ignited a movement to destroy the Antiquities Act, which presidents since Teddy Roosevelt have used to create national monuments. With no public hearings, Utah Rep. Rob Bishop in October passed a bill out of the House Natural Resources Committee to strip presidents’ authority to protect large expanses of federal land. “Its passage would mark a decided tilt in favor of industrial and political forces that have worked for decades in the West to dismantle safeguards for federal land and the environment. Its defeat would strengthen the influence of conservationists and tribes to develop and install new safeguards. The president and his aides have set out to reverse Obama-era restrictions on mining in the Grand Canyon, repeal rules for improving oil and gas leasing practices on public lands, and promote a program of ‘American energy dominance’ that could open boundary regions of national parks and the Arctic National Wildlife Refuge to oil and gas drilling. For an excellent analysis of what the Department of Interior is up to, read Adam Federman’s “The Plot to Loot America’s Wilderness” in The Nation (12/4/17). POSTSCRIPT (12/4/17): Trump did indeed announce plans to shrink Bears Ears by 85% (and Escalante by 50%), details and analysis in this NY Times piece. If you are in Salt Lake City, the Southern Utah Wilderness Alliance is organizing a demonstration on the south steps of the state capitol on Saturday, December 2: “Rally Against Trump’s Monumental Mistake,” 1-2:30 pm, Utah State Capitol. Facebook event invitation here. When Trump speaks in Salt Lake City on Monday, December 4, there will be a demonstration close to the capitol, location and time to be announced. 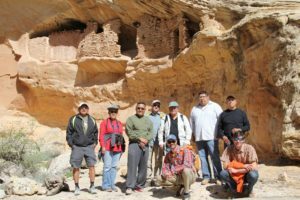 Support the Bears Ears Inter-Tribal Coalition with a year-end donation.